A friend asked me on Friday (I’m asked this every year) seeing I’d just returned from Europe, what was my recommendation as a traveling watch. One that you’d take with you on a trip to another country and why. In the event not a hard question for me to answer. My first word of advice is to leave the World Time Patek at home. Cheaper is good and you don’t want a watch that’s too complicated – you don’t want to refer to instructions all the time. Do you want/need extra functions, Chrono, Stopwatch or Alarm? What about changing times? because let’s be honest, a plain Day /Date analog watch is difficult to beat in practice, as you simply pull out the Crown, move the hands – job done. If it’s digital, can you remember how to set it and if it has a Word Time function, is that easy to remember and set? If it is – great, but if not, leave it at home. Crossing rivers? beach combing or swimming? – remember if you’re on your own taking the watch OFF at poolside, could be an easy way to lose it. So good Water Resistance is a must. So for me – Ease of use, readability in the dark and good Water Resistance (swimming, bathing, showers, heavy rains, whatever). 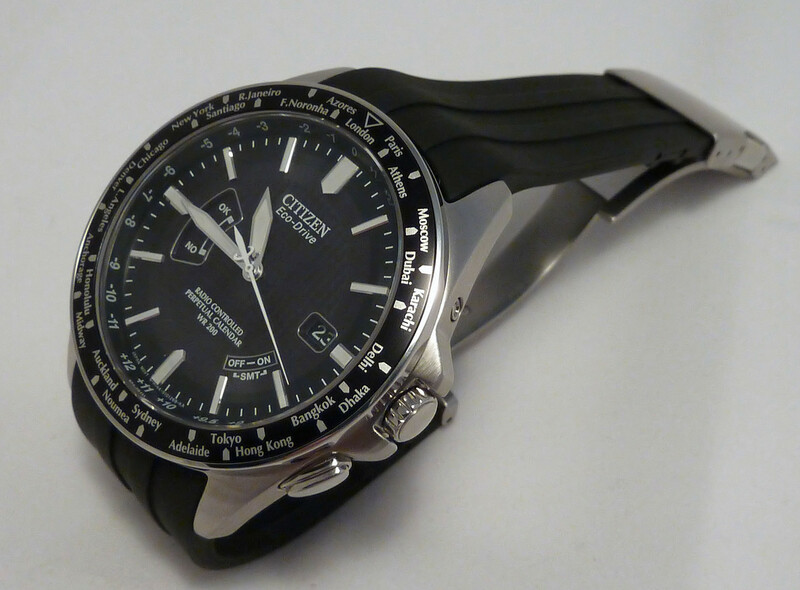 First choice is the Citizen Eco-Drive A-T CB0020-09E, which is quartz analog, with Date window, a built in World Time Perpetual Calendar module and step motor hands hidden away inside the watch workings. I love this watch as it’s understated and unobtrusive, yet packs serious functionality. For time changing it’s the best there is – To change to a Destination Time Zone, simply pull out the Crown, turn to another City Time Zone. The seconds hand instantly indicates that City on the dial index, push in the Crown and the analogue hands move around to the new time. It could not be easier. It’s also Water Resistant to 200m, has great luminous qualities, very accurate as its Radio Controlled and being Eco-Drive you can forget about batteries. This has to be my favorite and 1st choice for travel. My second choice is my “active” travel, third world, other places in the world watch. In this case I always take the Timex Expedition T49976. This is a Digital only model with Shock protection, Water Resistant to 100m. 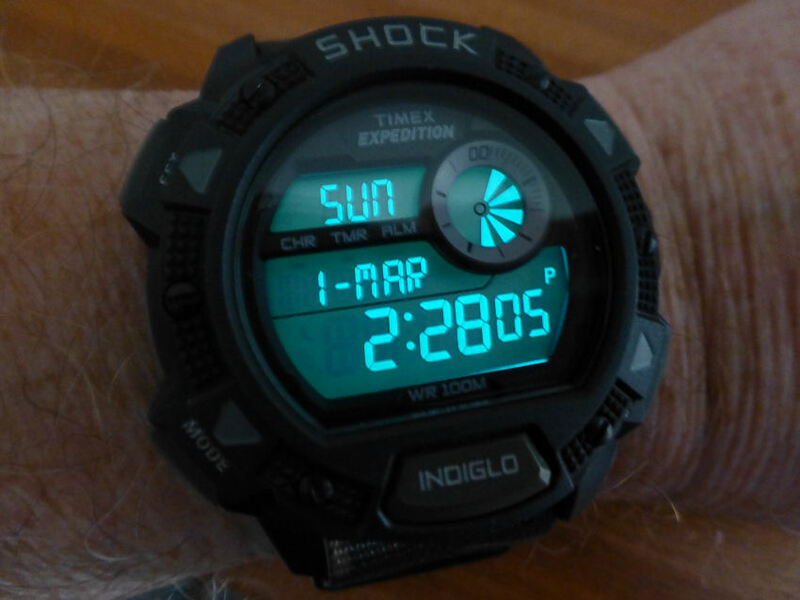 It has the best night/dark viewing of any digital watch I know (see image), shows at a glance the Day, Date, Month, Hour, Minute, Second and AM/PM indication. It has added functions such as Alarms (5), Stopwatch and Timer. It’s also not too big. And for travel destination times – it has Dual Time or one extra Time Zone which you can set either when on the way or pre-set before you go. And it’s super simple to set. Press and hold the Set button (upper left – says Set on it) the Time flashes, press the opposite button and it gives you the option to set the dual time. Follow the on screen stuff and before you know it, it’s done. This is one of the few models I know that actually shows what to do within the digital screen. No instruction book required! The watch is also as tough as old boots and the battery life is around 5 years – so no worries. And by the way you can have almost any strap you like on this watch, from NATO, to Textile, to Leather, to Velcro fast wrap – take your pick. The other important benefit, is the fact it only cost me around £40 new and I’ve got two, so depending where I’m going I sometimes take them both. Probably the best all round practical travel watch I know. However if you can’t be bothered with all this travel functionality stuff – I find that Divers models are a great travel watch, especially analog. They’re inherently tough, have great Water Resistance and being heavily luminous are very easy to read day or night. Rush job overseas? – chuck on my favorite Diver and off to the airport and for time changes, just move the hands . . . no brainer – it’s that easy. (I take my Apecks 200m). But for bespoke “travel” models I pick out the Citizen and Timex above, as I’ve traveled with both of them for many years and being an inveterate traveler, from jungles to deserts, Arctic to Antarctic, hot to cold, and with the odd war zone chucked in, they certainly work for me and have never let me down.